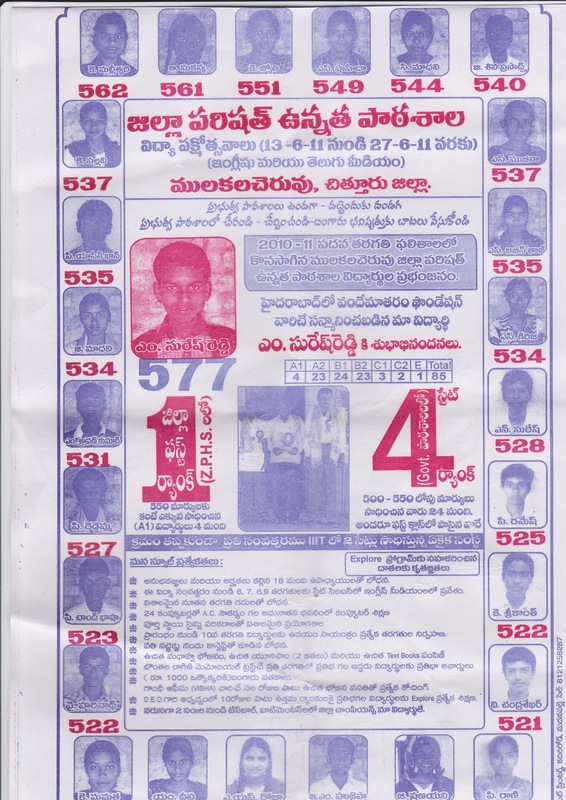 This publicity leaflet may appear strange to many, especially if one can read Telugu. This one was brought out by a Sikshana school months back- even I did not know about its existence till yesterday. It is from the Government (ZP) High school in Mukalacheruvu ( Madanapalle Cluster), in which GORD and Sikshana worked together during 10-11. In the SSCLC Examinations of ’11, 85 students appeared and all but one passed. Even the failed student scored 60% on the whole but could not get through just one subject – Telugu- since his mother tongue was different. 27 students scored more than 500 out of 600, the highest being 562 (94%). The biggest surprise of all: the average marks of all the students who appeared for the examination was 84%! These are extremely impressive figures by any standards – Private schools included- but the one that took the cake was what followed in their presentation. 40 Students migrated from Private schools to this Govt school in 8th Std , 20 in 9th and 10 in 10th at the beginning of the current academic year! That is a real shocker for anyone who still doubts that Government schools can deliver on their promises. This school was scoring 58% and 64% during the years preceding 08-09 when the current HM- Mr Prabhakar- came into the school initiating the upward swing. Of course the credit goes no less to the dedicated set of teachers who needed only this trigger to show their mettle. That the school is putting in its best efforts to rope in the community through publicizing the improved performance , which incidentally has resulted in the above reverse migration, speaks volumes about their determination to break out of the mold and show the better face of the Public Education System. My next stop yesterday was the ZP school at Pulikallu. Here there were 29 students last year and all of them passed. The average mark here was 92%! There was very little I could ask for in terms of improved performance in the examinations when the scores are this high already. I did suggest to them that they should focus on two things now onwards. The first is the ‘Achilles Heal’ of the entire system, which is the learning level in English. Marks apart, the ability of the students to understand and handle the spoken language continues to be poor. The second was to share their experiences and help the other schools in the cluster to emulate their results. We do need badly ‘leaders’ in the field who can become instruments of change. Maybe we will find some of them in these schools. It was seen that three out of the seven schools supported by us scored 100% results, something that has never happened in these schools in the past. I came back humbled by the experience; what a pool of talent is lying there waiting to be tapped by someone and how we are still reaching only the fringes with all that we are doing? This is something that both Vibha and Sikshana should ponder – besides hosts of others who could also chip in.